The most common psychology behind the nervousness is that one has not made the proper analysis and there is no backing of the trade with strong justification because of which the traders are nervous to lose their hard earned money. Good day to you. It is naturally that you worry, but try to put the control over your situation. Imagine the sum of money in your wallet that you can just throw away forever and lead trade on this money 9of cours if you broker’s conditions allow mini accounts). This bein nervous should pass after you see stable profit. All in all, you’ll also see that fx is not so terrible as seems to you now:) Good luck! Nowadays I really don’t bother if I am nervous or I am cool while operating. The reason for It is simple: I know I can make money in long term so the actual trade becomes irrelevant. 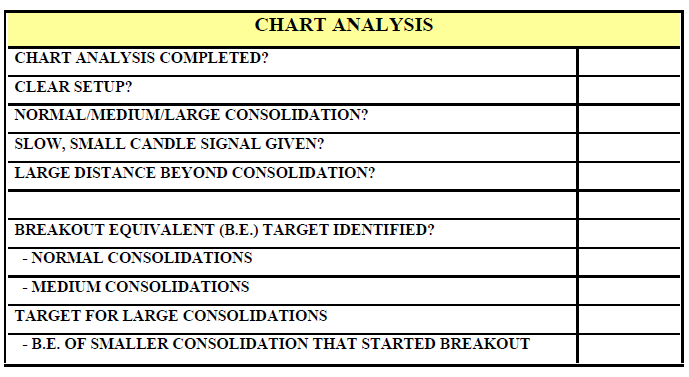 No one who can make sure will gain profit in certain transaction no matter how good analysis is. Maybe some expert traders could make analysis which is almost 100% same with market’s movement but they can’t do it all the time. Also, all expert traders will prepare good money management and risk management to limit loss when there is unpredictable movement in the market. So, it’s no need to be nervous in trading if you have proper trading plan to follow because profit or loss in the transaction, it is still under control. Nervous? I think to let trade an EA for you would be the best solution. In this case you will not have a weight of decision of the trade placing. Nervous? I think to let trade an EA for you would be the best solution. I am not Din77, but I don’t even know the one who makes a consistent profit by trading at all. I don’t think that it is good decision to use EA for trading especially if you don’t know about how it works because using EA can cause big loss too if you don’t use it in the right time and you don’t have good money management as your setting. So, don’t use EA with reason that you don’t want to handle your emotion control only because good trader must capable to control his own emotion. It’s a common thing to be nervous when you’re about to execute a trade. It could be a doubt to your analysis or it might be a call to you to cancel it. I’d rather cancel it than making a wrong decision and stop the trading activity for a while. I am disagree with you. Good traders shouldn’t be afraid with making wrong decision in trading because no one who can win in every transaction. If you trade when you’re very sure to make profits only, so it won’t happen when you’re still newbie. No one who can be confident with his decision directly in his first career in trading. It’s common thing to be nervous in trading, but don’t stop trading because you’re nervous only. As long as you have prepared money management and risk management then you don’t need to be afraid with possibility of loss. There will be never enough strength to trade in this case. Life is full of right and wrong decisions. We are already here anyway. I have that same problem but I am beginning to trust my system and it’s starting to get easier. I guess the only way for you to overcome the fears involved in trading is to find a system that you can trust. If you can’t trust your trading strategy it either means you don’t know it well enough and you need to study more or your trading strategy isn’t working for your personality. I recommend taking the time understand your trading strategy and money management and experimenting with different strategies to and see what works best. Agree. Make sure that trading strategy is really suits you well because it’s only you who could understand yourself and the way you want to trade. Very well said, in the whole of this world its only we ourselves who can understand us better and know better. Thus, we need to be true to ourselves and plan our life and also the trades accordingly so that we do not hurt ourselves and life around us. Great to see the nervous trade discussion is still alive. I wonder a few months on if the OP is still nervous? In any case I have to agree with Mr Gone’s post in September. Long-term trading is the key to cutting the fear. I literally just posted a thread on Vanilla Options trading, this should save traders from the fear factor but besides that, currency trading is about deviations from the mean. Many professionals run reversion to the mean strategies and have strong statistical based models, so they are basing their entire market ideology on the fact that the market trades around a mean and has standard deviations. Most traders buy and sell at the mean or around 1 standard deviation from the mean of the price distribution, hence so many losses but in actual fact traders who manage to buy a rising market coming out of a 2nd or 3rd standard deviation from the mean normally make money consistently and vice versa on the sell side. The big issue with short term trading is the bid/ask spread which in most cases is floating and tends to wipe out 3-5 pips in some cases more from the trader on entry and exit this tends to put the trader on a bad footing, so it almost feels like they are always too late or too early, this immediately creates psychological pressure, topped off by the fact that the market moves in the nano second. In my opinion, the only way to shake the nervousness is to only trade from long term high probability area. i.e. 2-3 standard deviations from the mean. I hope I made a meaningful contribution to the discussion. Remember currencies unlike stocks won’t go to 0. So I guess we can see the common sense in my point?.. It becomes a question when to buy rather how much. 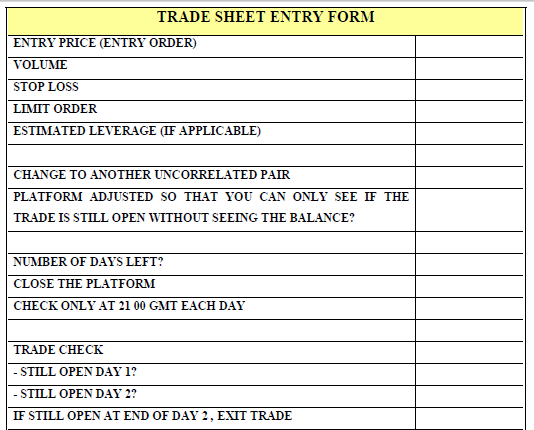 My advice is to ensure you have a Trading Plan Trade Sheet. I used to be nervous too especially trading smaller time frames. These move very quickly and the minute you enter a trade, there is a possibility to lose very quickly. This creates a lot of unnecessary tension and nerves. This is one of the many reasons I and others switched to the larger time frames and Swing Trading. 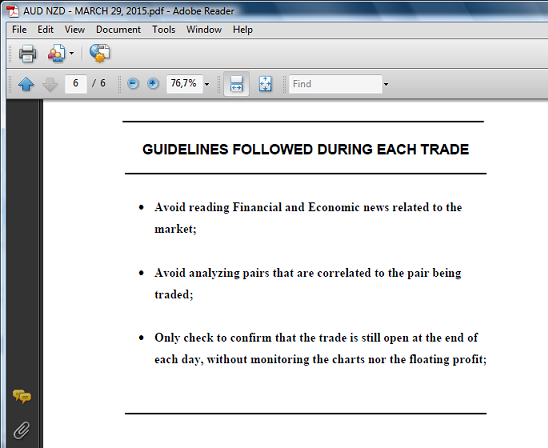 Nevertheless, whatever time frame you use…get a Trade Sheet that has rules and checklists to justify each trade. I found that whenever I traded without this, I would be unsure if I had taken everything into account before clicking that button. This uncertainty creates anxiety and fear. If you have Trade Sheet that you know will provide you with a good trade 80-90% of the time, you will be more confident. It gives you a visual confirmation that you are making the right decision and that everything has been accounted for. This guides me through all steps involved in the trade - from analysis to closing of the trading platform as well as while the trade is in motion. If you use something like this during Demo Account phase and the results are good, then just use it on the Live Account and the nerves will fade away and be replaced by celebration of trading wins. Interesting thought Emerald, reversion to the mean, I have seen guys call it the ‘money line’. I’m guessing the mid point on a daily, so Eur/Usd currently is down from that level. I’ve just sort of eyeballed a mean around 1.1100 which, by chance, is the 200 sma and the 100 sma. By equal chance that level is former support in Jan 15 and Jun 15 , then resistance July, then support Sep, the finally resistance on Oct 28 past. Will be good to keep any eye to see if price can make it up there in the next month or so - about 450 pips away from now.